Rove beetles, or Staphylinidae, make up the largest beetle family in North America, with approximately 4360 species known from the continent (Evans 2014). The hairy rove beetle, Creophilus maxillosus (Linnaeus), is one of the largest and most distinctive species of rove beetle found in North America. It is easily recognizable due to the characteristic yellowish gray, hair-like setae covering the elytra and abdomen (Figure 1). These scavengers can often be found on carrion and are avid predators of fly larvae, primarily carrion maggots. They are considered beneficial for their role as predators of these and other pest fly larvae, as well as for their importance in forensic entomology. However, accidental infestations of hairy rove beetles in urban households have made them an occasional target for pest control. Figure 1. Dorsal view of adult hairy rove beetle, Creophilus maxillosus (Linnaeus). Photograph by Graham Calow, NatureSpot. Hairy rove beetles are globally distributed and occur primarily in the Northern Hemisphere, where they occupy various habitats, including open fields, forests, coastal areas, and occasionally residential areas (Evans 2014). Creophilus maxillosus occurs on nearly every continent, and is separated into two subspecies with the nominate subspecies, Creophilus maxillosus maxillosus, primarily occurring in the Palearctic, and the subspecies, Creophilus maxillosus villosus, occurring in the Nearctic (Brunke et al. 2011, Smetana and Davies 2000). In North America, the range extends from California to Florida and as far north as Alaska, Ontario and Québec. New populations have recently been confirmed in Peru and Iraq, and tropical islands such as Hawaii (Figure 2) (Asenjo 2007, Augul et al. 2017). They are commonly encountered throughout Europe and parts of Asia (Figure 3). Hairy rove beetles can generally be found wherever carcasses containing maggots appear in suitable habitats. Figure 2. Adult Creophilus maxillosus (Linnaeus) collected in Hawaii. Larva pictured on bottom right. Photograph by Conrad Gillett, University of Hawaii. Figure 3. Global distribution of Creophilus maxillosus (Linnaeus). Computer generated distribution map revised 2012 by John Pickering, Discover Life. This map has not been updated to show the recently discovered populations in South America or Hawaii. Eggs: Eggs are typically laid on carrion. They are milky white in color, and approximately 2 to 3 mm in length. Eggs usually take three days to hatch, although this is dependent on environmental temperature (Kramer 1955). Larvae: As do most rove beetles, Creophilus maxillosus passes through three instars for an entire larval stage lasting approximately 14 days. Body length of the first instar is 6 to 9 mm, while that of second instars is 10 to 15 mm and third instars are 15 to 25 mm (slightly longer than the adult) (Frątczak and Matuszewski 2014). Hairy rove beetle larvae are brown to black with stout, cylindrical bodies (Voris 1939). Like most other rove beetles, hairy rove beetle larvae are active predators and have well-developed legs for walking. In addition, the head, thorax, and first few abdominal segments of the larva’s body are highly sclerotized, while the distal portion of the abdomen is weakly sclerotized and maggot-like in appearance (Figure 2). 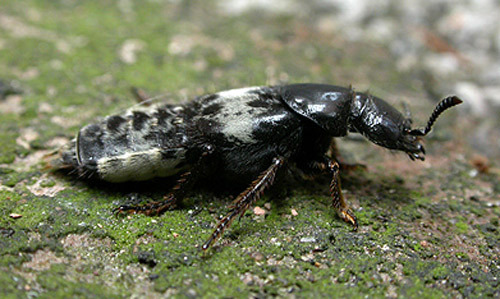 Adult: The adult hairy rove beetle can vary between 12 and 23 mm in length and is therefore, relatively large compared to other species in the family Staphylinidae. It is distinctive in appearance and, as indicated by its name, can be distinguished from other species by the yellowish gray setae found on the second and third (and sometimes fourth) abdominal segments, as well as on the elytra where they form wide bands that encircle the abdomen (Figure 4). These characteristic setae are absent on the head and pronotum, which are both glossy black and heavily sclerotized. The antennae are composed of eleven antennomeres, and the legs are entirely black with a 5-5-5 tarsal formula (Smetana and Davies 2000). In addition, the adult hairy rove beetle has a strong pair of mandibles, which it utilizes for preying on maggots and scavenging on carrion. Like most rove beetles, Creophilus maxillosus is dorso-ventrally flattened, and the short elytra leave the distal 6 to 7 segments of the abdomen exposed. The abdomen itself is very muscular and flexible, which is useful for quickly rolling into a defensive posture (Figure 5). Figure 4. Lateral view of adult hairy rove beetle, Creophilus maxillosus (Linnaeus). Photograph by Trevor and Dilys Pendleton, www.eakringbirds.com. When well-fed, an adult female hairy rove beetle can lay up to eight eggs per day and up to 500 during her lifetime (Greene 1996). Even with a 30% mortality rate from egg to adult, the progeny from one female could number nearly 422,000 females in only three generations. The life cycle from egg to adult lasts approximately 37 days, with three to four of the days in the egg stage, 14 days in larval development, and 16 days in the pupal stage (Kramer 1955). Like most rove beetles, Creophilus maxillosus can be found in a variety of habitat types, including leaf litter, under tree bark, on decaying fruit and vegetation, under stones, and especially on carrion. They generally prefer moist environments and are often encountered near ponds, lakes, moist soil, and along coastal plains. Adult hairy rove beetles have two cuticular sacs located underneath the seventh abdominal tergite, which are used to secrete a defensive chemical fluid. When disturbed, the beetle everts these glands and rotates its abdomen, wiping this chemical cocktail against the threat (Jefson et al. 1983). Hairy rove beetles use this survival defense mechanism to repel ants during carrion competition and to ward off larger predators, as well as humans. 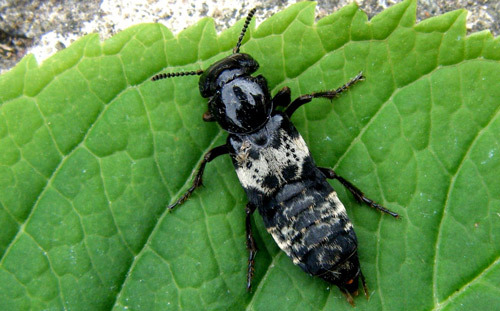 In addition to its chemical defense, the hairy rove beetle can curl into a defensive posture (Figure 5), as well as inflict a painful bite with its powerful mandibles if threatened. Figure 5. Adult hairy rove beetle, Creophilus maxillosus (Linnaeus), displaying curled-up defensive posture. Photograph by Graham Calow, NatureSpot. Hairy rove beetles are not generally considered pests. Because adult hairy rove beetles prefer to lay their eggs in fresh sand, true household infestations are unlikely. However, accidental rove beetle infestations have been reported in urban households. Infestations may be caused by carrion inside the structure such as a dead rat or wildlife in an attic or soffit space. In these instances, residual treatment of the entire house with specific insecticides will result in short-term reductions in staphylinid populations, and direct treatment is another effective method as well (Wills et al. 1990). Individual beetles may enter houses by flying to exterior lights or lights projected through windows. Despite the occasional home invasion, hairy rove beetles, along with other related species, are known more importantly as biological control agents of pest fly populations (Pfeiffer and Axtell 1980). These beetles have been used to reduce pest fly populations via predation and competition for resources. As a biological control agent, this species benefits the livestock industry by improving sanitation and, therefore, in helping to reduce the spread of fly-transmitted pathogens (Pfeiffer and Axtell 1980). 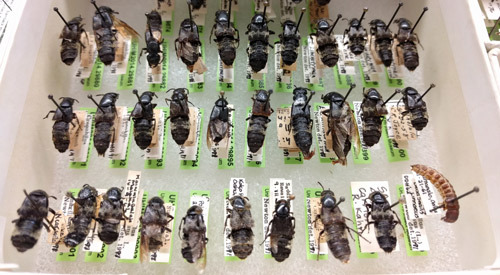 Creophilus maxillosus beetles, along with other carrion-feeding rove beetles, are valuable tools in forensics. 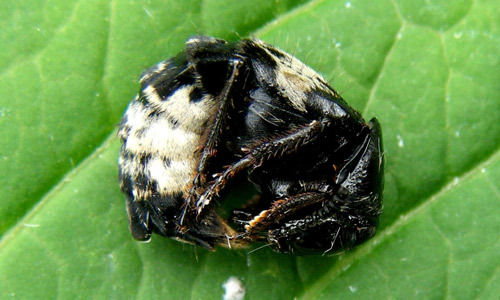 Knowledge of the hairy rove beetle’s life cycle allows forensic entomologists to determine ecological succession, and subsequently, the post-mortem interval (PMI) of a cadaver (Matuszewski 2012). Some researchers have questioned the accuracy of these methods because succession on a corpse can be highly variable depending on the geospatial location, environmental conditions (i.e. temperature and humidity), and type of dead organism in question. During warm summer months, adult hairy rove beetles can inhabit a corpse as early as two days after death, with incubation time lasting five days (Wang et al. 2008). The presence of larvae, in conjunction with adult absence, indicates a much later PMI. Asenjo A. 2007. First record of Creophilus maxillosus (Linnaeus), 1758 (Staphylinidae) for Peru. The Coleopterists Bulletin 61: 551-551. Augul RS, Al-Saffar HH, Ali HB, Rassoul MA. 2015. First record of hairy rove beetle, Creophilus maxillosus (Linnaeus), 1758 (Coleoptera; Staphylinidae) for Iraq. International Journal of Current Microbiology and Applied Science 4: 82-85. Brunke A, Newton A, Klimaszewski J, Majka C, Marshall S. 2011. Staphylinidae of eastern Canada and adjacent United States. Key to subfamilies: Staphylininae: tribes and subtribes, and species of Staphylinina. Canadian Journal of Arthropod Identification 12: 1-110. Evans AV. 2014. Beetles of Eastern North America. Princeton: Princeton University Press. Frątczak K, Matuszewski S. 2014. Instar determination in forensically useful beetles Necrodes littoralis (Silphidae) and Creophilus maxillosus (Staphylinidae). Forensic Science International 241: 20-26. Greene GL. 1996. Rearing techniques for Creophilus maxillosus (Coleoptera: Staphylinidae), a predator of fly larvae in cattle feedlots. Journal of Economic Entomology 89: 848-851. Jefson M, Meinwald J, Nowicki S, Hicks K, Eisner T. 1983. Chemical defense of a rove beetle (Creophilus maxillosus). Journal of Chemical Ecology 9: 159-180. Kramer S. 1955. Notes and observations on the biology and rearing of Creophilus maxillosus L. (Coleoptera, Staphylinidae). Annals of the Entomological Society of America 48: 375-380. Matuszewski S. 2012. Estimating the preappearance interval from temperature in Creophilus maxillosus L. (Coleoptera: Staphylinidae). Journal of Forensic Sciences 57: 136-145. Pfeiffer DG, Axtell RC. 1980. Coleoptera of poultry manure in caged-layer houses in North Carolina. Environmental Entomology 9: 21-28. Smetana A, Davies A. 2000. Reclassification of the north temperate taxa associated with Staphylinus sensu lato, including comments on relevant subtribes of Staphylinini (Coleoptera: Staphylinidae) American Museum Novitates 3287: 1-88. Voris R. 1939. The immature stages of the genera Ontholestes, Creophilus and Staphylinus Staphylinidae (Coleoptera). Annals of the Entomological Society of America 32: 288-303. Wang J, Li Z, Chen Y, Chen Q, Yin X. 2008. The succession and development of insects on pig carcasses and their significances in estimating PMI in south China. Forensic Science International 179: 11-18. Wills LE, Mullens BA, Mandeville JD. 1990. Effects of pesticides on filth fly predators (Coleoptera: Histeridae, Staphylinidae; Acarina: Macrochelidae, Uropodidae) in caged layer poultry manure. Journal of Economic Entomology 83: 451-457. Map: John Pickering, Discover Life.